I’m feeling a little uninspired today so I thought I’d post about last night’s dinner. Last week, when I was at my parents’ house and went to Whole Foods with my mom, there was a ton of stuff I wanted to buy. Not only because my mom would pay, but also because shopping at a suburban Whole Foods was far more pleasant than shopping at the crowded, hectic NYC Whole Foods. However, because I had to carry whatever I bought back to NYC with me I only bought one thing. Buffalo wing hot sauce cheddar cheese. 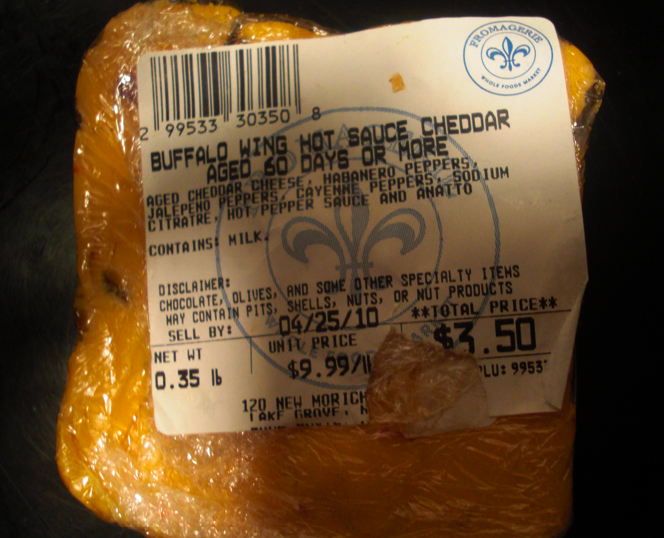 I love buffalo wings so I thought, “Why not try the cheese?” I had it last week in grilled cheese with a tomato and it was delicious. 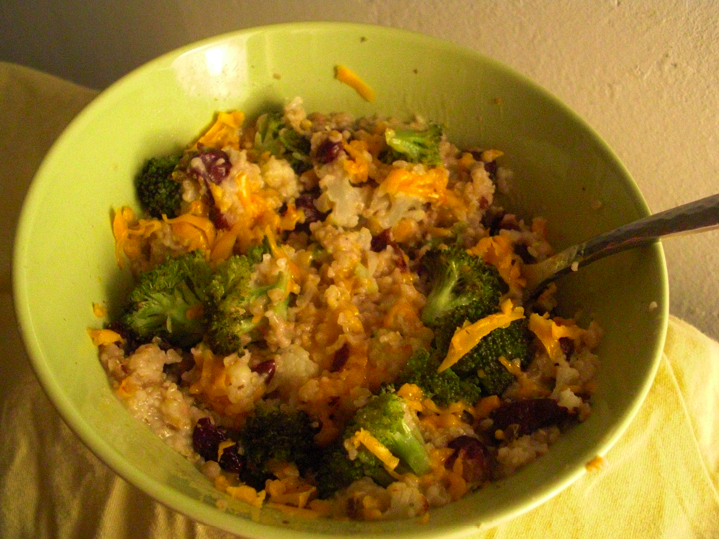 But tonight I decided to try it in savory oats. 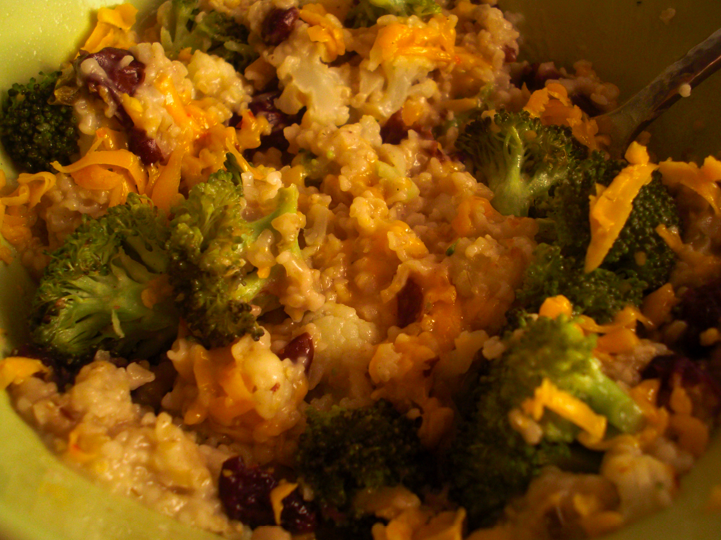 Steel cut oats, broccoli, cauliflower, kidney beans, garlic, onion powder, salt, pepper, olive oil, and the hot wing cheese. It was good. The cheese didn’t add a ton of flavor, but I also didn’t add a lot of cheese. It did add a nice spicy kick at the end of the bite which I enjoyed. I’d say it’s a winner. Sorry for the lame post. I’m not really feeling the exercising lately. I think my crappy workouts over the weekend did some mental damage. I also have this strange pain in my left foot. I broke my big left toe several years ago and it kind of feels like the joint below the toe is bothering me. I’ve been heating and icing it so hopefully that will help. And I took yesterday off from exercising. I’m supposed to to cross training tonight, but if it still hurts I might give it more of a break. I had the new Chobani Strawberry Banana yogurt yesterday. Really, really, really, really, REALLY awful. Inedible in my opinion. It had that horrible fake banana taste (like Laffy Taffy or whatever it’s called) and it was sickeningly sweet (and I love sweet food). I’ll be sticking with the pineapple. And I did like the raspberry. I promise this will be a much shorter post than my previous few. I don’t know what’s been wrong with me, I’ve been babbling! Sorry for the bad pic, I took it with my Blackberry and meant to post it on Twitter, but then never got around to it. The outfit actually doesn’t look that ridiculous in the picture. When I went to buy copious amounts of Pineapple Chobani I was surprised that the store had the two new flavors. I bought one of the Strawberry Banana and one of the Raspberry. I was going to bring the strawberry banana one for the second half of my breakfast this morning, but then I realized that I had a strawberry banana Greenmonster for the first half of breakfast and I should probably change it up a little. I really liked the raspberry. Raspberry isn’t my favorite berry in general (when will someone make a blackberry Greek yogurt?? ), but I thought this was very good. I could definitely tell there was less fat than in the 2% pineapple, but I don’t think that’s a negative thing. After the grocery store I had the best run yesterday. I keep forgetting to finish stretching. Weird, I know, but I do half, get distracted, never finish, and then start running and feel tight after a few minutes. For a total of 26:33! Crazy! I really didn’t think that last mile would be so quick, I thought I was dragging after going so quickly at the beginning. And I’m not sore today. I was a bit sore when I got back yesterday, but it seems to have gone away this morning. And no ankle pain and barely any swelling! I also had the best dinner last night. It’s my dream dinner. Trader Joe’s British muffin with White Chocolate Wonderful PB, burned brussel sprouts, 2 slivers of cheddar cheese, and an orange. I also had an unpictured small glass of red wine and 2 squares of Lindt sea salt chocolate. Yumm, I need to buy more of this peanut butter, it’s so good. Finally (see, I told you it would be short), check out these amazing pictures. They were taken by someone I work with while they were on an aerial shoot with an author. I’m often the first the rag on New York City, but I think these pictures are just breathtaking. I just finished making up a batch of Snobby Joe’s. While I haven’t tried one yet, they look delicious. It was my first time ever cooking with lentils and it went really well. Finished picture to come once I’ve actually eaten one! My plan was the eat one for dinner tonight. I was supposed to go out for BBQ with friends around 9. But if we went out around 9 that means we wouldn’t eat until 9:30 or 10 so I knew I would need something to hold me over. And I didn’t want to gorge myself on BBQ. But then one of my friends got sick, so now I’m meeting the other friend for dinner around 8 so I don’t need to eat the Snobby Joe. I still wanted to make them so I had them for the week, though. I woke up early and had a great workout at the gym. After that I picked up a bagel and then made a stop at the grocery store. I came home and watched tennis. Rafa lost 😦 and painted my nails. My all time favorite nail color is called Pasadena Purple. It’s the color that Ginnifer Goodwin’s character wears in He’s Just Not That Into You, I had loved it on her in the movie, but I had no idea what it was. Then a friend (actually the one I’m having dinner with tonight) found a thing in Entertainment Weekly saying what color it was! Nubar is a great line of nail polish, I’ve bought other nail polishes from them since then and they go on really well and stay on for a while. Plus they’re environmentally friendly! My nails beforehand were looking pretty shabby. My mom had given me these nail polish remover pads for Christmas. They worked really well. It was weird because it was actual felt material. I’m off to stretch my ankle and finish getting ready. I hope everyone has a great Saturday night! Oh and best of luck to everyone running the Disney Marathon tomorrow!! You are all inspire me! Early tomorrow I head back to NYC. I’ve been trying to make the best of my last day in the suburbs. I had planned to wake up, watch tennis, workout, have a Green Monster, run some errands, pick up lunch , relax, make my family dinner, and then pack. Unfortunately when I woke up it was snowing. Yet again! I don’t think I’ve ever seen so much snow in such a short period in the NY area. I woke up, watched tennis, and then things started to go astray. I kind of procrastinated for a while after the tennis was over so I didn’t start my workout, the No More Trouble Zones DVD, until almost noon. This was the first time I ever did the full No More Trouble Zones DVD, I had only done the first four circuits before. The first four are so easy compared to the later core ones! I feel like I got a real workout! I think my legs and arms and glutes and everything else are going to be screaming tomorrow! By the time I finished the workout around 1pm it was really snowing. I didn’t want to drive to do my errands in all the snow, but I did want to go to Subway for lunch. So I conquered my fear of driving in the snow! I hung around the house for a while and then the snow stopped! I headed to Target and the Grocery Store (I wanted to buy heavier stuff here so I didn’t have to worry about carrying it in the city tomorrow). The roads weren’t bad, but of course none of the parking lots were plowed. I bought a plate at Target to keep at work so I can stop wasting paper plates to warm up my food. And it’s nicer to eat my lunch on a real plate. I made my family dinner tonight. I usually refuse to cook for them because they’re so picky (ironic, right?) and pretty unhealthy. But I thought I should do it at least once since I’ve been home for so long. I wanted the Buffalo Chicken Pizza recipe from Carrots ‘n’ Cake. But my parents don’t eat spicy food. So I made two! Just tomato sauce and cheese for my parents and Buffalo Chicken for me and my brother. I changed the recipe up a little. I used blue cheese dressing instead of ranch, I didn’t have Frank’s buffalo sauce so I just used regular Frank’s hot sauce, and I put a few blue cheese crumbles on top. It was DELICIOUS! So totally unhealthy and decadent, but amazingly delicious. And I ate half of the pizza above and I have another half to eat for lunch tomorrow. I was going to wait and do this post in the morning because I’m exhausted and have a terrible stomach ache (more acid stuff, I don’t know why I get this sometimes! ), but I want to use the bathroom before I go to bed and my roommate is in there so I figured I would use my time wisely. I had a great workout at the gym today. I ran 3.1 miles on a 2.0 incline in 29:53. It’s the first time I’ve done a 5k in under 30 minutes. I wish I could run longer at the gym, but because I go during peak times I can only use the treadmill for 30 minutes. So I’m trying to make the best of what I have. I did the Stairmaster for 20 minutes on level 7 after that which was tough, but so rewarding. Then abs and stretching. It’s just great to see such an improvement. Not only in my running but also in my flexibility. I came home and made a delicious dinner. Whole wheat pasta with cauliflower, broccoli, and pesto. I cut up as much broccoli and cauliflower and I wanted for 2 servings, parboiled it for 2 minutes and then tossed it with 2 tablespoons of pesto, a small amount of seasoned breadcrumbs, a sprinkle of red pepper flakes and then put it on a casserole and drizzled it with a little bit of olive oil. I then baked it at 400* for about 15 minutes or until the veggies were tender. I cooked enough pasta for 2 servings and then tossed the pasta with 2 tablespoons of pesto and then added in the veggies, mixed it all up and voila! A delicious and relatively easy dinner. I used the last of the pesto I made here. I love that I made it at the beginning of August and I still have some left at the beginning of November. Off to bed, hopefully this heart/stomach burn goes away soon!